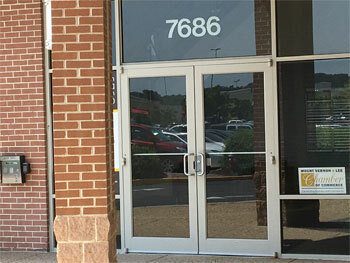 Mount Vernon Lee Chamber of Commerce is now located at 7686 Richmond Highway and is part of the vibrant business community at Mount Vernon Plaza. When the Chamber was organized in 1954 its first home was in Hybla Valley where the shopping center is now located. 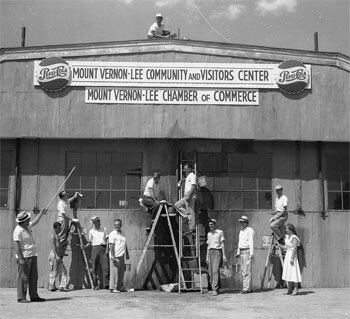 Look at this wonderful photo of original chamber members putting the finishing touches on the old hanger converted to a Visitors Center. The Chamber founders were a great group of civic-minded individuals. I had the honor to meet a few when I first started at the Chamber in 2001. Ernie Corso, who was the energy behind the Mount Vernon Lee Chamber actually attended and spoke at the Chamber's 50th Anniversary celebration. Howard Marler was the photographer who took this photo and recorded many Chamber events. Both he and his wife Ruth served on the Board at various times. Since the Chamber represents businesses in both Mount Vernon and Lee Districts, when the lease at 6821 Richmond Highway expired in August it was time to cross the highway and be in the Lee District again. The Chamber Board of Directors meets with each of the Supervisors quarterly and when we told Supervisor McKay that the Chamber was moving to Lee District he was very excited, welcomed us to Lee District, and suggested that we change the name of the organization to the Lee Mount Vernon Chamber of Commerce. On a more serious note, it is a difficult thing to move a business. The Chamber is really just a small business and has the same challenges any business has that does not own its own location. Tenants are subject to the property owners and what they think are appropriate terms for a lease. A business locates somewhere, establishes an identity with that location and is inclined to stay there if at all possible. But sometimes it just doesn't work out. Having been with the Chamber for almost 18 years, I have moved the office location three times. In 2001, the Chamber was located in Pear Tree Village Court, just off Richmond Highway and Cooper Road, behind the McDonalds. With BRAC, that center was sold to an investor out of Washington DC and we had to find a new home. From that location we moved to 6911 Richmond Highway, which years ago was the best office space available on the highway. Designed by a local architect, Attorney Gant Redmon had his office on the fourth floor and First Virginia Bank occupied the first floor. Those glory days were a long time ago. From there we moved to 6821 Richmond Highway and now to Mount Vernon Plaza. Having looked up and down Richmond Highway for office space, I came to the conclusion years ago that no business would move to the highway unless they really had to or they really wanted to due to a lack of options for office space. Fairfax County may have more vacant office space than it would like but that space is not on Richmond Highway. The good space that is available here is leased. The space that isn't leased should be upgraded and then tenants will come. If there is no office space then there are no businesses. Businesses need office space and the chamber has always tried to ensure that office is part of new developments. .
Federal Realty Investment Trust is a good example of taking existing office space, upgrading the space, and being very successful in leasing the space. They own the office space in Mount Vernon Plaza in the back corner near Michael's which is our new home. Five years ago when I looked at the space there was worn red carpet on the floors, mis-matched office doors, and a gloomy feel. Today everything is modern and welcoming. New paint colors, new carpet, new doors, even new windows where there were none previously, and a whole new feel. This area is also a HUB zone and should be a natural magnet for business. The Chamber was attracted to this vibrant commercial center and hopes to be a good addition to all that is happening here. At some point this fall we'll do an open house and invite you to come and see the new office. We'll see where the next five years takes us.